Teesside University Pro Vice-Chancellor Professor Jane Turner OBE has been confirmed as the keynote speaker for the first Tees Businesswomen Awards to be held this year. Tees Business is organising the first event of its kind at Wynyard Hall Hotel on November 8. The awards will celebrate women in business on Teesside, with the overarching long-term aim to inspire a new generation of women to succeed in business and create more female entrepreneurs and business leaders than ever before. And Tees Business is delighted to confirm Professor Turner (pictured above, right), who is also the university’s gender champion, as the inaugural event’s headline speaker. Teesside University is also supporting the event by sponsoring the top award – the very first Tees Businesswoman of the Year. • Build a bank of mentors to support women of all ages. “I’ve been in my role as pro vice-chancellor for Enterprise and Business Engagement for just over two-and-a-half years,” said Professor Turner. “During that time, I’ve met some amazing business leaders and as a University we work very closely with them. But I’ve also been very struck by the fact that most of the known business leaders are men. Laura Woods, director of The Forge, Teesside University’s business hub, and chair of DigitalCity (above, left), added: “Women are the silent stars of the Tees Valley economy. “They’re what keeps the economy going, they’re the opportunity of the future, but the trouble is they don’t really have a voice at the moment. “What we need to do, and what they need to do collectively, is make sure they do get their voice heard and the rest of us listen to it. 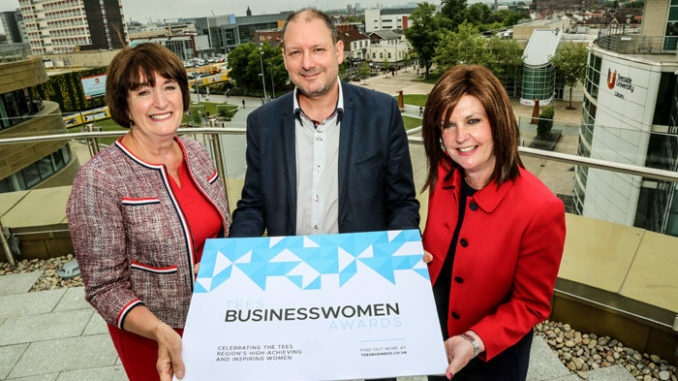 Tees Business co-editor Dave Allan added: “We’re absolutely delighted that the very first Tees Businesswomen Awards has quickly won the support of Teesside University, which is very much one of the Tees region’s beacons. Some category sponsorships are still available for the awards – click here to find out more. Full entry and criteria details with deadline dates, as well as the judging process, will be announced soon.